We've been harvesting lots of okra from our small garden, so we've been enjoying steamed okra for weeks now. The hubs and I love steamed okra served with alamang you know! 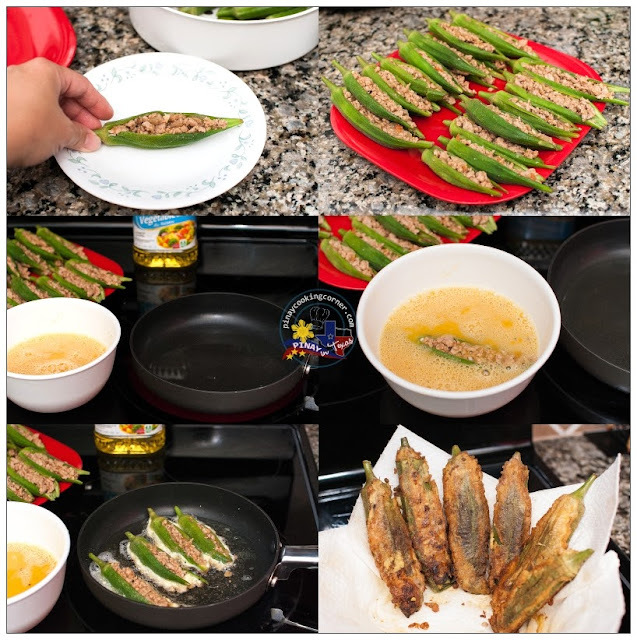 But yesterday, I thought of making something different with the two dozen pods of okra that I have --- I made Rellenong Okra! I sauteed about a pound of ground pork, tomatoes, onions and garlic, filled the okras with it, dipped them in beaten eggs then fried them. It's actually the first time I tried making this...and guess what? It's good! Now I know what to do with okra aside from steaming and using them in Bulanglang, Pakbet, and Sinabawang Isda. 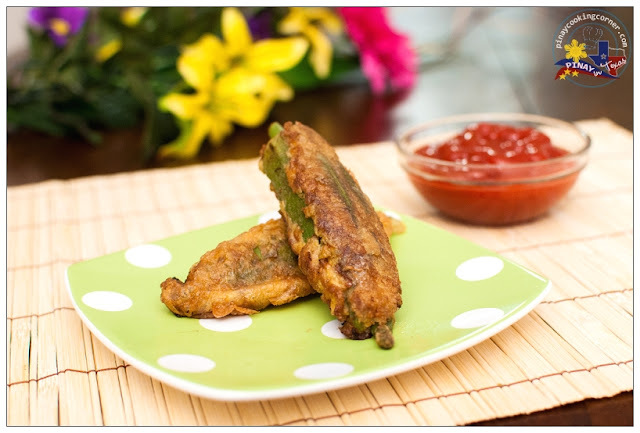 My daughters who are not so fond of okra loved it! It's a little time consuming to do but it's worth all the effort. You should try it! 1. Steam okra for about 10 minutes. Transfer to a plate and allow to cool down. 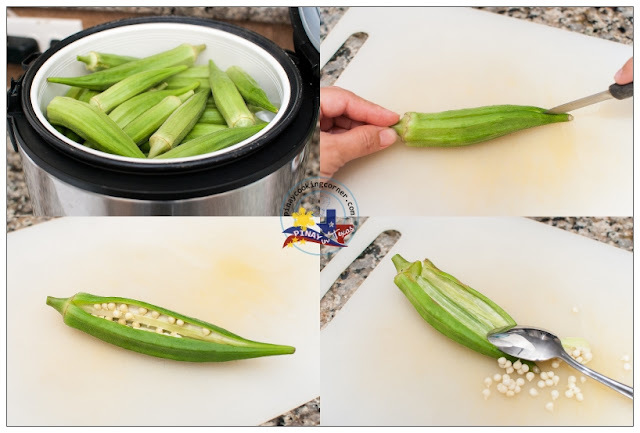 Cut the middle part of the okra with the tip of a knife but make sure not to cut through. Scrape the inside with a spoon to remove seeds. 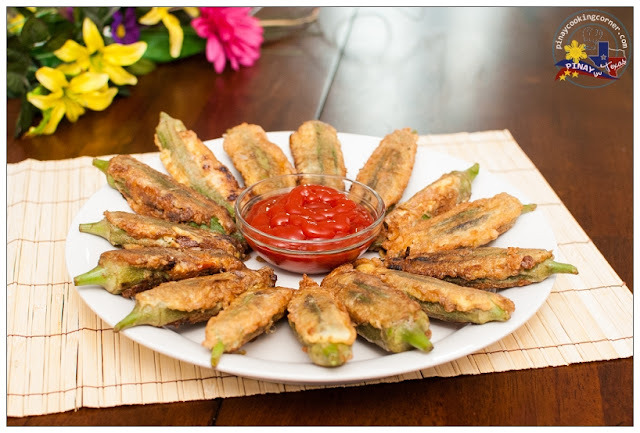 Do this with all the okra. Set aside. 2. In a skillet over medium heat, saute garlic in olive oil until light brown. Add onions and tomatoes. Saute until tomatoes are soft. 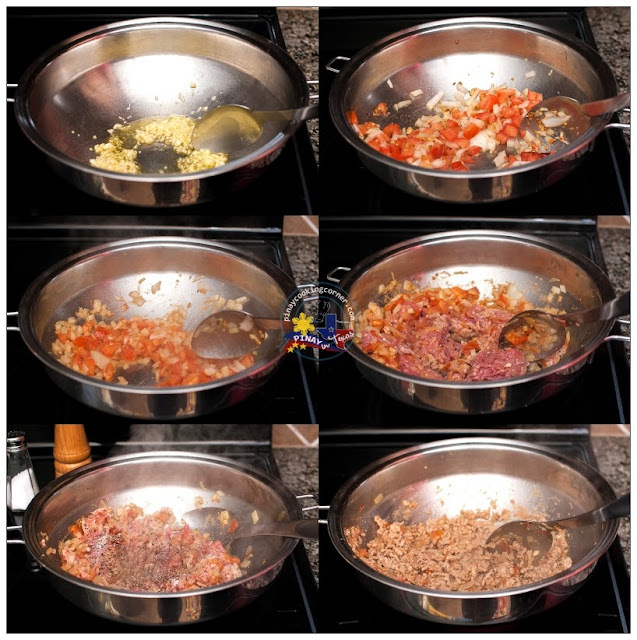 Add ground pork and saute until there's no more red part showing. Season with 1 tsp salt and 1/8 tsp black pepper. Cook for about 15 minutes or until pork is tender. Remove from heat and allow to cool down for about 5 minutes. 3. Season the beaten eggs with about 1/2 Tsp salt, 1/8 tsp black pepper and 1 tsp garlic powder. Set aside. Scoop about 1 Tbsp cooked ground pork into each okra. Heat up about 5 Tbsp vegetable oil in a skillet over medium heat. Dip one okra in beaten egg then put in the skillet with the inside of the okra facing upward. Fry for about a minute or until golden brown then scoop about 1/2 Tbsp beaten egg into the filling. Flip the okra to cook the other side. Repeat procedure for the rest of the okra. 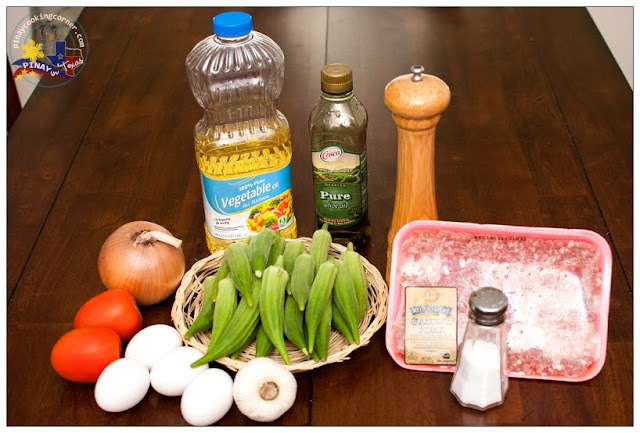 Place fried okra in a bowl lined with paper towels to drain. Transfer to a serving plate. Serve with ketchup. I like okra, but cannot say the same thing for my husband...I never had it stuffed...sound and look delicious Tina. 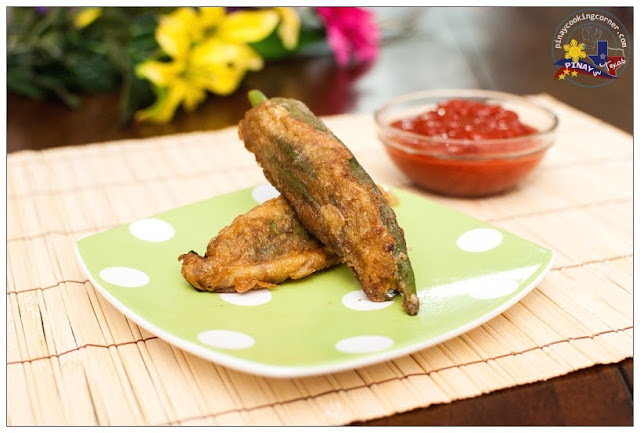 The filling sounds great,stuffed okra looks so delicious. So creative! Texans must love this too!